This series of pics should be the next cover of The Journal of Behavioural Finance. Love it! Perfect! 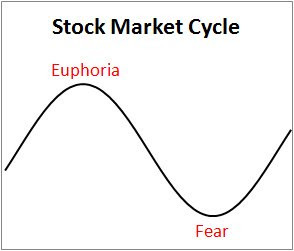 It kills me to see posts that say "I've had enough -- I'm selling all my stocks" right at the end of one of the worst months in market history. Thanks, Preet. This was one of the rare times that I was inspired to do something mildly artistic. It was fun! Patrick: I agree. I've seen too many comments like this as well. Even bloggers who say all the right things like "stay the course" often then go on to advise shifting out of riskier assets, etc. Of course, this just means selling some stocks rather than selling all stocks. 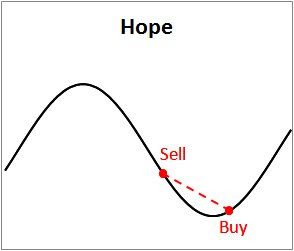 Even people who should know better seem unable to stop themselves from selling low and buying high. 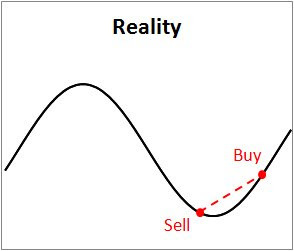 Unfortunately, picture # 2 is how most people seem to invest. CC: I assume you mean that most people try to invest based on the "Fantasy" picture. 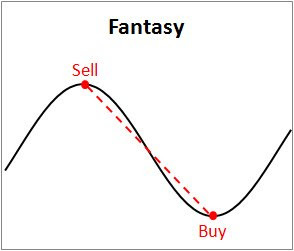 Sadly, some end up with the reverse of the "Fantasy" picture where they buy at the top and sell at the bottom. Oops. I meant to say the reverse of picture # 2 is how people seem to invest, at least, judging from studies that show actual stock returns are much less than market returns. Brilliant. I was going to post earlier in the week, but I couldn't think of anything insightful to say... still haven't.